Is your smile less than perfect? Do you have gaps, odd shaped teeth, or teeth than are not as white as you’d like? Dental veneers are very thin, custom-designed shells of a tooth-like ceramic material that get placed on top of your existing teeth. This thin veneer offers a beautiful, natural looking appearance and provide a strong tooth structure once the bonding is completed. The life like appearance, stain resistance, beauty and durability come only from porcelain restorations. The advantage to a porcelain veneer is that it enables the final appearance to have a more natural appearance than other treatments and this quality alone makes them ideally suited for the best cosmetic look. White dark, yellow or stained teeth. Now, if porcelain veneers are out of your budget, there are newer composite materials available can also provide a great enhancement. With a lower cost than the popular porcelain veneers and the ease of repair, these dental restorations are also a great alternative. 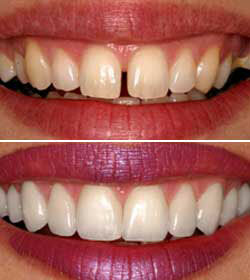 Plus, these composite dental veneers are typically applied in one day, with no waiting. The disadvantages are that they are not as strong as porcelain and they tend to discolor around the edges after several years. Typically this is easily repaired with minimal expense. To learn more about how dental veneers can help you create that beautiful smile you deserve, contact our office at (513) 896-1573 today.